How do you pick the 10 thinkers in the world whose ideas are making the biggest ripples? It’s a task sort of akin to asking: which are the 10 most beautiful flowers in a meadow? Luckily, we don’t have to answer this intimidating question. Because CNN is all over it. Today, CNN Tech published “The CNN 10: Thinkers,” a look at the 10 science and technology “visionaries whose ideas are shaping our future.” And since seven of the people on the list have given TED Talks, boiling down their very big ideas into 18 riveting minutes, we thought we’d share those talks below. Today, Regina Dugan is the head of special projects at Google-owned Motorola Mobility working on cool initiatives, like an electronic tattoo that can be used to identify a user instead of a password. But when she spoke at TED2012, this mechanical engineer was the director of the Defense Advanced Research Projects Agency (DARPA), in charge of innovation for the U.S. armed forces. In this talk, she describes some of the agency’s incredible projects, including a prosthetic arm that is governed by thought. 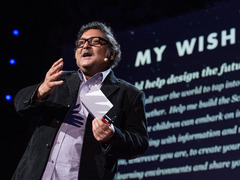 Sugata Mitra, who won this year’s TED Prize, is famous for his Hole in the Wall experiment, whereby he left a computer in an unassuming alley of a slum in India and watched in amazement as kids taught themselves how to use it. The experiment led him to think: are we approaching education from the right direction? In this blistering talk from TED2013, Mitra shares his vision for kids organizing in groups for the ultimate learning experience, at a School in the Cloud. Elon Musk founded PayPal, which changed the game of shopping online. 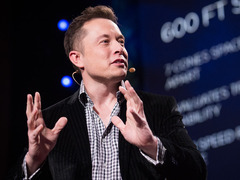 But he didn’t stop there—he went on to found SpaceX, which aims to revolutionize space travel, and Tesla, which aims to popularize a fully electric car. At TED2013, Musk has a discussion with TED curator Chris Anderson about these enterprises and his newest, SolarCity. It’s a look at a man capable of seriously out-of-the-box systems thinking. Jennifer Pahlka is deputy chief technology officer at the White House, aiming to make the U.S. government’s use of tech bigger and better. For this undertaking, she is currently on leave from the organization she founded, Code for America. 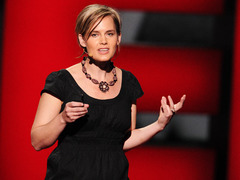 At TED2012, she talked about this organization, which makes coders into activists by having them develop smart and efficient apps to solve the problems they see in their neighborhoods. 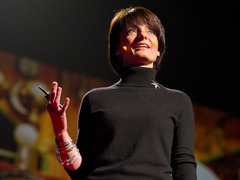 At TED2013, Mary Lou Jepsen predicted that in 5 to 15 years, we’ll be able to communicate with our thoughts. (Her talk from TED2013 hasn’t been published yet, but you can read about it on the TED Blog.) As in, the resolution of brain scan systems will increase at such a rapid pace that we’ll be able to send the things we’re thinking directly into the digital media world. The possible applications are amazing, says Jepsen, who works at Google X (the company’s secret test lab), for those suffering from diseases like Alzheimers … and for people who are perfectly healthy. Bre Pettis is the co-founder and CEO of MakerBot, the company producing the first affordable 3D printer. He is also a TED Fellow, and at TED2012 shared how the company was poised to bring a revolution in craftsmanship. (Pettis’ talk is also unpublished, but you can read more about it on the TED Blog.) Calling it “17th century technology made with 21st century tools,” Pettis shared how the MakerBot community allows tinkerers, designers and artists to collaborate online, leading to an explosion in printed creativity. “The CNN 10: Thinkers” is a part of CNN Tech’s look at the state of innovation in 2013. The series began with a look at “The CNN 10: Startups” in June. In November, the site will publish “The CNN 10: Gadgets.” And in December, the series will end with “The CNN 10: Ideas.” And we’ll be curious to see what they choose for that. Pingback: Can You Really Succeed with Elon Musk? Pingback: Embracing Innovation: Where Can Technological Advancements take Your Laboratory? Pingback: CNN’s Top 10 Thinkers of 2013 | TAL Group, Inc.
Reblogged this on Sobre Creatividad, Innovación, Talento y Liderazgo. Do you enjoy TED talks? I do…and my son watches them almost every day. They are intriguing, inspirational, creative, interesting. It is no surprise to me that 7 of the top 10 thinkers of 2013 have given TED talks. Enjoy the following article!